Brad Paisley and Carrie Underwood are back. The duo is slated to bring their award show hosting duties back to the Country Music Association Awards for a third year in a row. Brad Paisley and Carrie Underwood will play emcees during the November 10, 2010 CMA Awards ceremony being held in Nashville, Tennessee. Anyone who has ever watched these two country superstars share the stage and hosting responsibilities during past CMA Awards telecasts, knows they can bring the funny. Unfortunately for Carrie Underwood, Paisley is already setting the wheels in motion to make Underwood’s wedding to Mike Fisher a target. “We have to bring it up,” Paisley said. During the interview, Paisley and Underwood couldn’t help but zing each other, especially when it came to the interesting bowl the country crooner’s wife, Kimberly Williams Paisley, picked out for Underwood. “Is it something you wanted or it’s in the pile of re-gift items?” Paisley joked. “You’re going to get it back three Christmases from now,” replied Underwood. “I can’t wait to get that back,” Paisley playfully fired back. 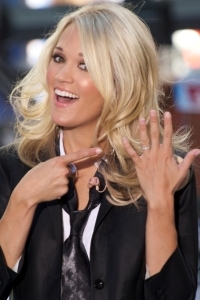 In the past, Carrie Underwood’s style has been praised while serving as host for the CMA Awards. The former American Idol champ turned country’s sweetheart is known to have multiple wardrobe changes throughout the show. Last year Underwood donned more than ten outfits. Viewers know why these two hot country singers are back for a third time hosting the CMA Awards, but do they? “I do feel like we do have our own roles that we fall into and compliment each other,” said Underwood. “At this point three years later, we have each other pretty well figured out, so I think it will go really smooth,” added Brad Paisley. Catch the CMA Awards live on ABC from Bridgestone Arena on November 10.